Why don’t you tell people that they can check for trees and buildings when aiming an antenna by using a laser pointer. It’s bright enough to see during the day and you can get an idea if there’s going to be something in the way of the antenna. I admit that it would probably work great. But that doesn’t mean you should do it. I’ve been told that gasoline makes a great floor cleaner but that doesn’t mean you should use it to clean your floors. This is pretty much the same thing. A pocket sized laser can travel 5 miles or more before it’s weak enough that it doesn’t blind someone. However your eye will really only be able to see it for about 1,000 feet. So you don’t really know what you’re point at. I’m sure I don’t have to remind you but I will anyway. Lasers can blind pilots and make it hard for them to keep their passengers safe. They can damage the eyes of small children and small animals even if pointed there for a very short time. While we think of lasers as toys today, they were developed as very powerful devices. Larger ones are still used for cutting and even in military applications. Just use a compass. Use the compass on your phone when you’re aiming and then just look forward. If you want to get an idea of what’s “straight ahead” you can put the compass on top of a ruler, a yardstick, or any sort of straight thing. Then just look ahead. Because, remember that antenna signals don’t need to take that laser-straight path to you either. By the time the signal gets to you, it can be pretty wide. Plus, antennas have something called “Beam Width.” If you don’t feel like the long read, here it is in a nutshell. Beam width tells you how far off you can aim an antenna and still pick up the signal. 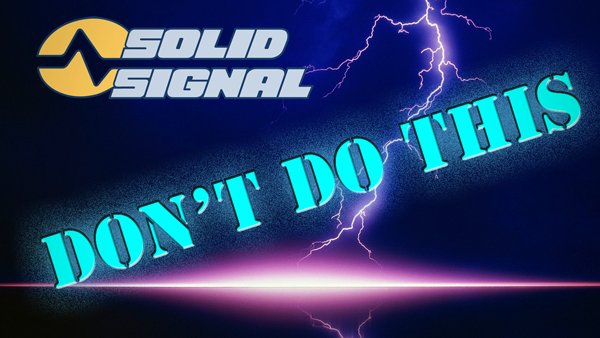 You don’t need to be “laser focused” and neither does the signal. A broadcast signal is going to make its way past trees and buildings. It may lose some strength along the way but it’s not like there is this straight line that defines the signal path and every other path is a waste of time. you can use an app on your phone like the one provided by Winegard (iOS version here / Android version here.) I reviewed this app several months ago and I found that its augmented reality view really helped locate the towers very effectively. The app is free and you already have the phone. No matter what you choose to do, please don’t use lasers outside for any reason. It’s just not a good idea.